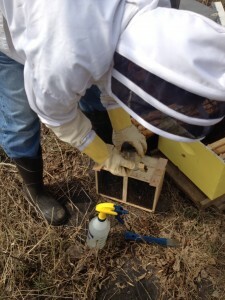 When we had all the frames arranged inside the hive boxes and ready to load, we’d spray the bees with sugar syrup to distract them and wet their wings so they couldn’t fly up at us, slip out the can of food and pull out the little queen cage. 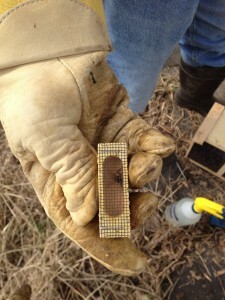 Pocketing the queen to keep her warm, I shook the workers out of the package into the prepared hive. The queen cage has a cork in one end, so I carefully pop the cork, and replace it with a mini-marshmallow jammed into the hole. 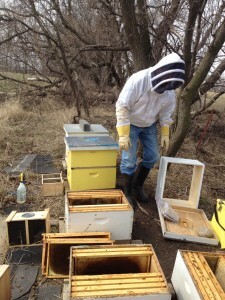 The bees will chew that marshmallow out within the first day, releasing the queen into the colony…Ready to get to work! And when we’re done shakin’, frames are replaced so each hive box has ten (for brood and honey on the lower boxes). I pop a bucket of simple syrup (sugar water) on the inner cover so the bees have some extra carbs as food, the outer covers are put on, and a rock or branch on top of it all to keep the lids on in the wind. 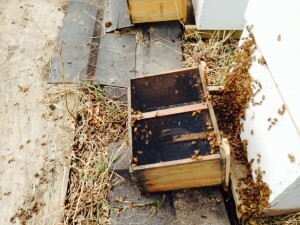 Any bees that remain in the package will find their way inside with the rest over the next hour or so. Now, we leave them alone for a week or so. 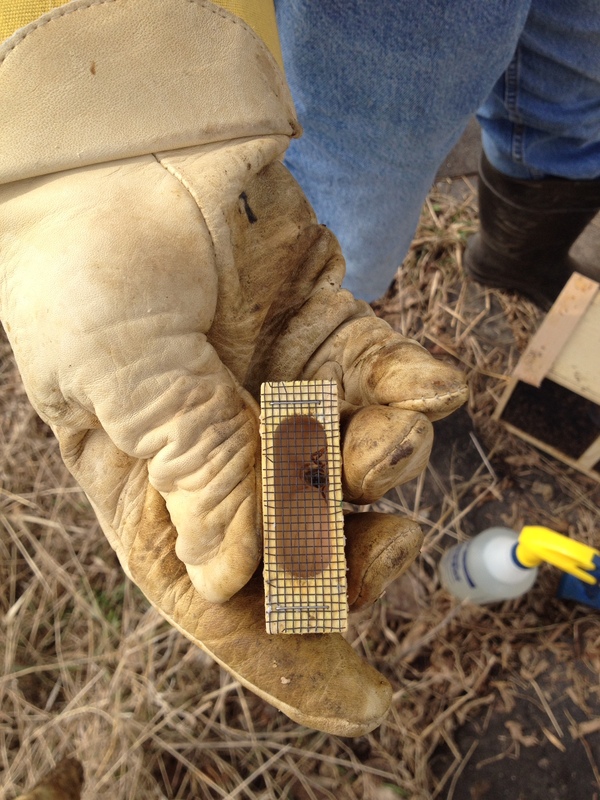 The queen will start laying, and as it warms up, her rate will increase and at some point the queens can lay up to 2,000 eggs a day! (time from egg to adult worker is 18-21 days…so you can do the math on population increase). And pretty soon we’ll have early spring flowers. 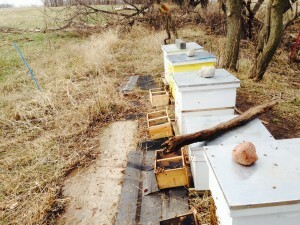 But the dandelions are the first big nectar crop that we have in Minnesota, so we all look forward to that. Another load of packages will be coming in from Georgia this time, this weekend April 19. More news after that.